Gambian President Yahya Jammeh said he would not step down and condemned mediation by West African regional bloc, ECOWAS, that aims to get him to leave power after he lost a December 1 election to challenger Adama Barrow. The comments on state television late on Tuesday were a hardening of the veteran president’s position after days in which hopes mounted he could be persuaded to hand over power at the end of his mandate on January 18, when Mr. Barrow is due to be inaugurated. “I am not a coward. My right cannot be intimidated and violated. “This is my position. 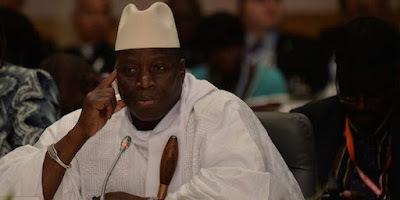 Nobody can deprive me of that victory except the Almighty Allah,” Mr. Jammeh said. “Already the ECOWAS meeting was a formality. Before they came, they had already said Jammeh must step down. I will not step down,” he said. Mr. Jammeh initially accepted the results of an election whose outcome was seen across Africa as a moment of hope. He is accused by human rights groups of the detention, torture and killing of perceived opponents during his 22-year rule. On December 9, he reversed his position and said he would challenge in the country’s Supreme Court the results of an election he said was riddled with irregularities.